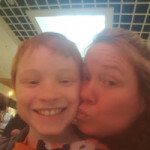 I recently spoke with Dr. Samir about how wonderful Liam is doing, and wanted to update you all. Without your hard work and support, I truly believe my son would have languished or become worse. He is now fully included in a public school here in Oregon with his peers. He receives pull-out support in his academics. Next year, he will be receiving his academics with his peers with the support of a small group and assistant. He will be pulled out for extra support. He has reached all his academic goals and is at grade level in all areas, with the exception of fine motor writing. He will enter the 4th grade next year. He participates in extra curricular activities: swimming, Tae Kwon Do, and gymnastics. He loves Legos, dinosaurs, the Pink Panther, and of course, his hero, Indiana Jones. He wants to be an archaeologist some day. This week he is in an intensive Lego Robotics camp with peers his own age. He no longer cries himself to sleep at night, nor has nightmares about incidents of the past. He is happy and talks about wanting to college because he believes he is a “smart boy, and that’s what smart people do”. Words cannot express how grateful I am to have found you all and for what you did for my son. I do believe your work saved a little boy. I was part of NHCDC at its very inception and I am glad to see it grow so beautifully. I worked between the years of 2005- 2006 as a pediatric physical therapist and the center has provided me with the utmost work ethic and professionalism, which I have carried elsewhere and respected today in the US among my colleagues and seniors. NHCDC is a platform where knowledge and experience meets at a dignified level. You are always in reach of your subordinates and professional enough to manage things independently. As a Physical therapist, I had the opportunity to learn everyday and be guided when I needed assistance. It is a platform, which works on evidence based practice and brings every new treatment protocol, which will benefit our clients in every domain. I am so proud to be a part of this institution and even today feels like I am associated with it as I was 6 years back . I wish every member of this team great success and many more achievements in future. From the very first day I spent at NHCDC, I felt like this is where I belong. I longed to come back next morning even after having a long tiring day. The kids I shared my hands and experience with gave me utmost satisfaction. This is a place I have learnt more than any other place elsewhere. Dr. Samir Dalwai has been encouraging and did bring out the best in each one of us working with him. Having the finest team members is very important for a multi disciplinary rehabilitation centre. And ‘NEW HORIZONS’ got those finest team members every parent dream of for their child with special needs. I am glad that I was part of them even it was for shorter duration. Wish all the best to NHCDC team towards the betterment of every child.